Be the first to share your favorite memory, photo or story of Carlanne. This memorial page is dedicated for family, friends and future generations to celebrate the life of their loved one. 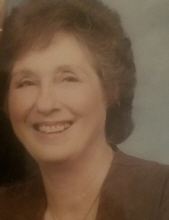 Carlanne Taylor, 79, of Vidor, TX died Friday, March 29th, 2019 at her home surrounded by her family. She was a longtime resident of Vidor and a member of First United Methodist Church in Vidor. She was also a member of The Daughters of the American Revolution. Carlanne enjoyed working in her garden and doing yardwork, working with many crafts and loved cooking. She volunteered for many years at the soup kitchen, served many Thanksgiving meals at the church and initiated the sack lunch program for homeless travelers. Visitation will be Monday, April 1, 2019 beginning at 6:00 p.m. at Memorial Funeral Home of Vidor. Funeral services will be Tuesday, April 2, 2019 at 10:00 a.m. at First United Methodist Church in Vidor. Interment will follow at Del Rose Cemetery. Carlanne is survived by her husband; Ronnie Taylor of 49 years, 1 daughter; Rebecca Sanders and her husband Brett of Vidor, 3 sons; Joe Taylor of Vidor, Troy Taylor of Orange,TX, and Scott Taylor and his wife Valerie of Stephens City, VA. She is also survived by 5 grandchildren, 10 great grandchildren, 1 sister; Marion Boyer, and 2 brothers; David Wilks and George Wilks. She was preceded in death by her parents; Lowell Efton Wilks and Clara Louise Wilks, 1 brother; Lowell Wilks, III and 1 niece; Diane Tatum. To send flowers or a remembrance gift to the family of Carlanne Taylor, please visit our Tribute Store. "Email Address" would like to share the life celebration of Carlanne Taylor. Click on the "link" to go to share a favorite memory or leave a condolence message for the family.